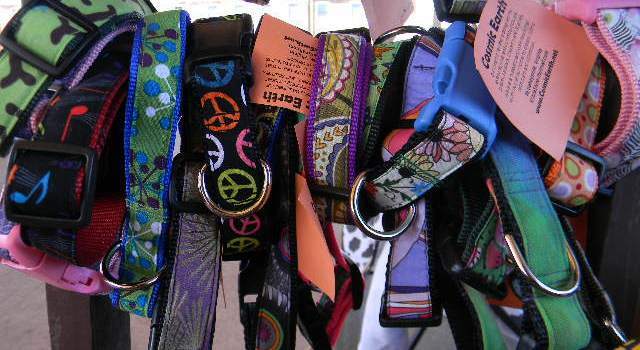 Find us at the Harrisonburg Farmers Market on Saturdays. Here are the things that we got made up this week. 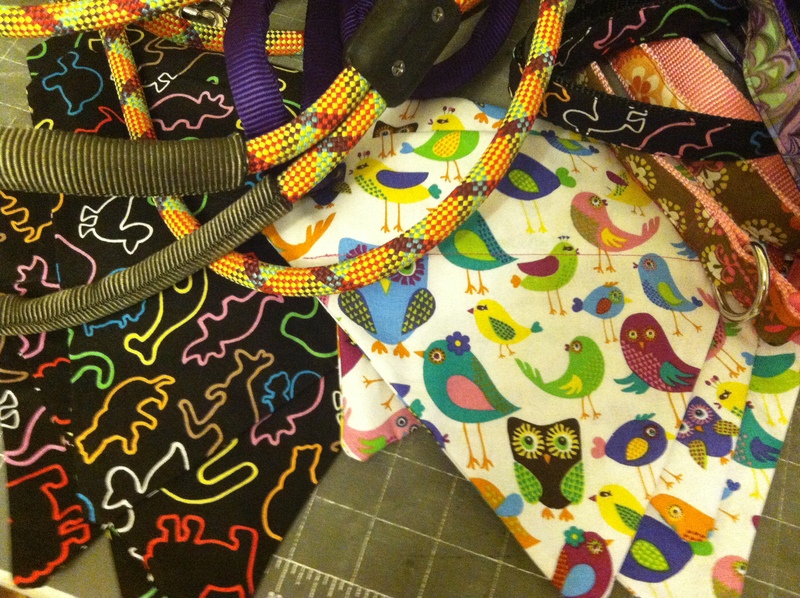 I have a pile of Large and XL size collars and some scarves and rich made some climbing rope leashes. 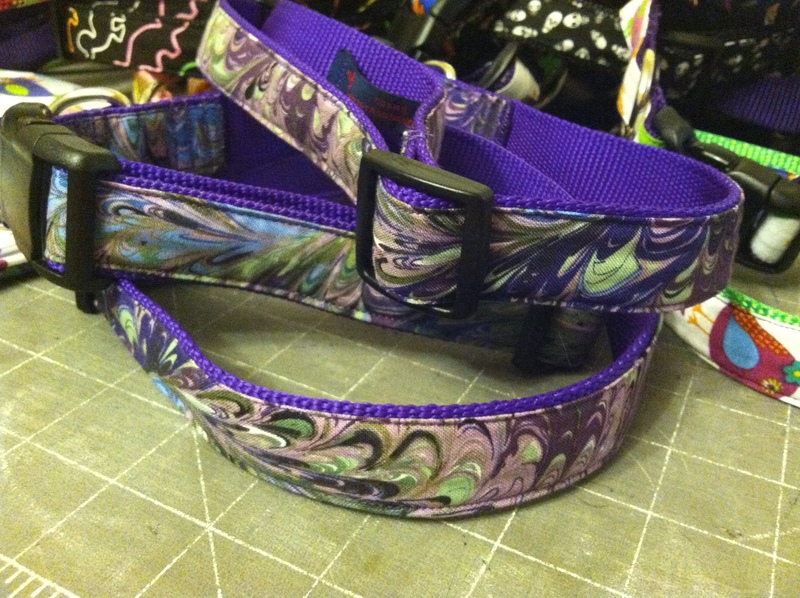 I love the new purple collars. The fabric looks really cool cut down to collar size! Everything will be available on Saturday. 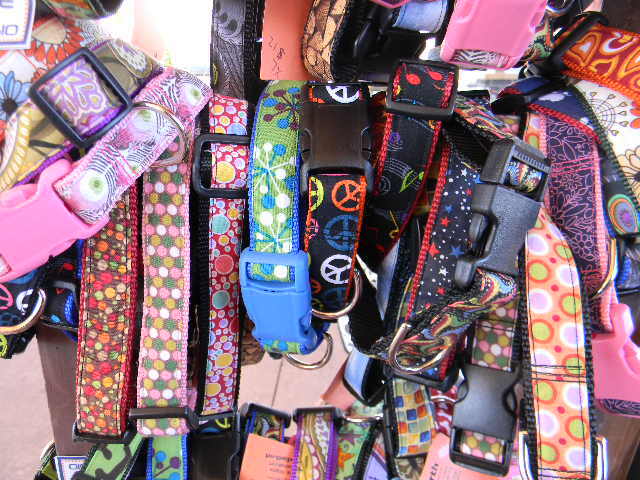 Just a few of our new collars. 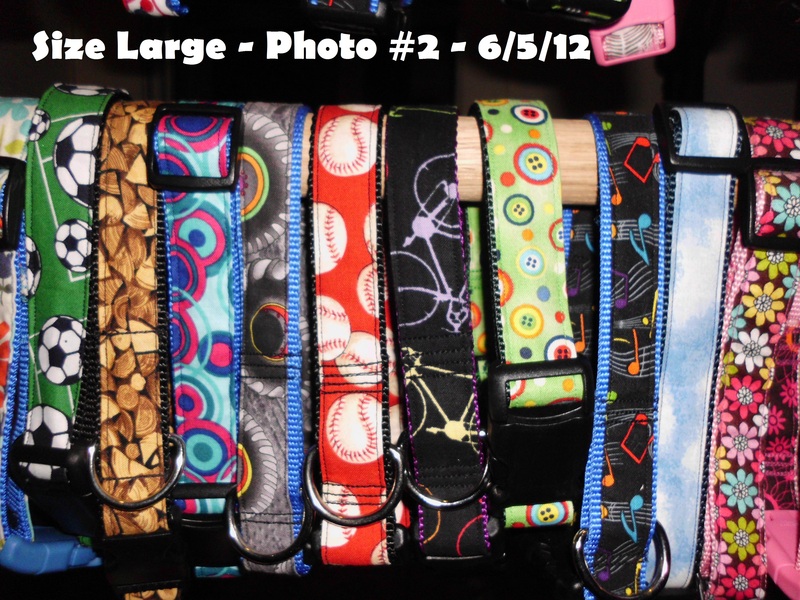 We have so many different ones right now, we can’t fit one of each on the collar rack! I think that is pretty exciting. I started to work with BioThane this Saturday. It’s a whole new beast on a whole new machine. A bit of a challenge, but I really like the material and am really enthusiastic to be moving into it. 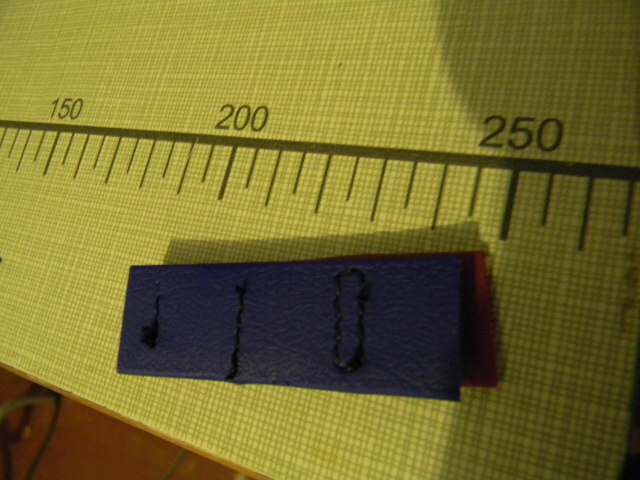 I followed the added instructions given for sewing BioThane and gave it a whirl on some test pieces. At first I had a lot of success and was thrilled. 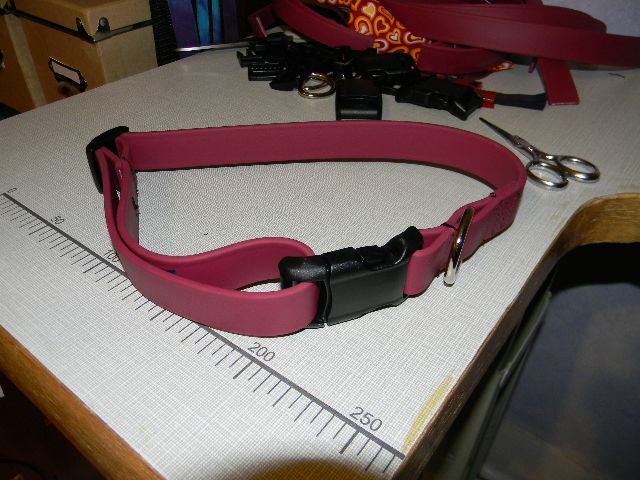 I made two collars and was feeling pretty steady about it. So I started to go into production mode and started working on them batch style. 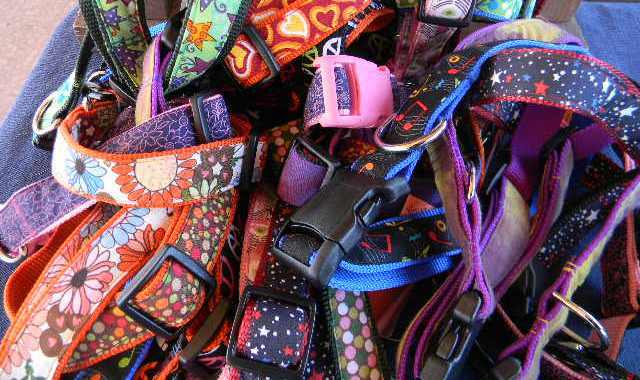 This means I get a couple dozen going at the same time, completing one step in the process on all of the collars at one time, before moving onto the next step. 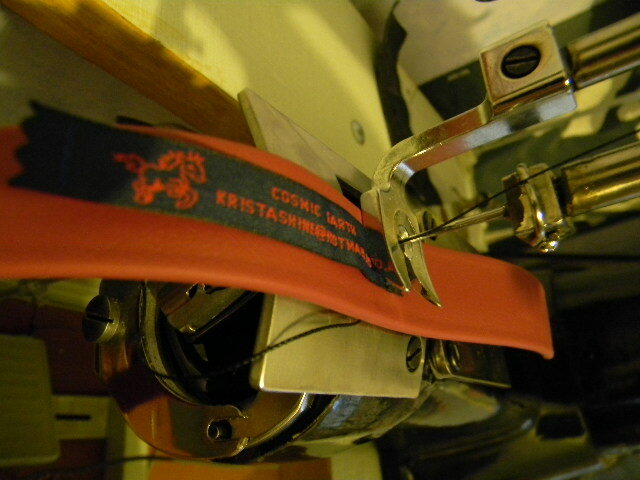 Sewing batch style speeds up the process, and it also helps regulate and provide more ease of consistency. A little while into the process the bobbin ran out so I rewound and replaced it, which also requires a full rethread of the machine. I also changed out the needle while I was at it. Sounds easy right? I sure thought so. 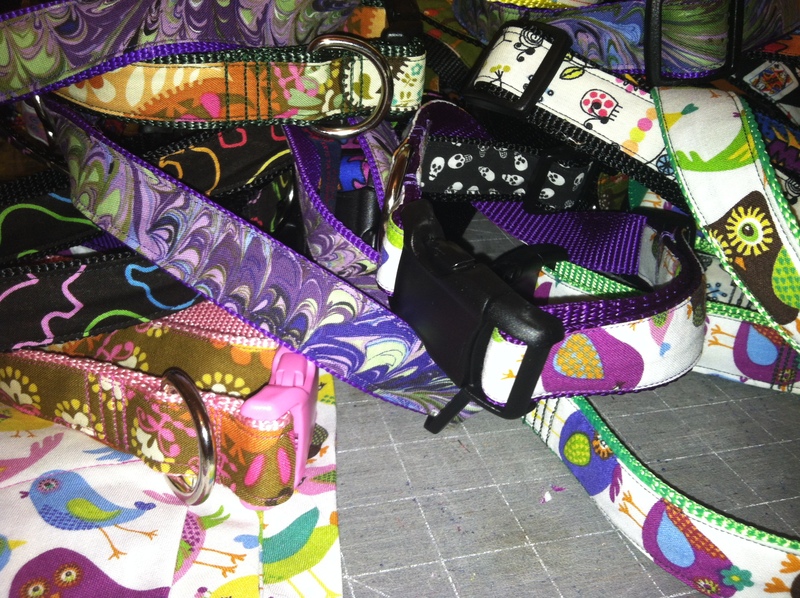 Having worked with sewing machines for over 20 years, I didn’t bat an eye. Boy was I wrong. The thread was no longer knotting. I spent the next three hours rethreading, rewinding, and trouble shooting in general before I called it a loss for the night and went to bed. Sunday I got up, positive outlook and all, and spent three more hours repeating the same steps over and over trying to figure out where I was going wrong. I eventually picked up the phone and called Neely’s Saddlery and left a message for help. Then my ego limped along with me to the couch where I spent some time sulking. 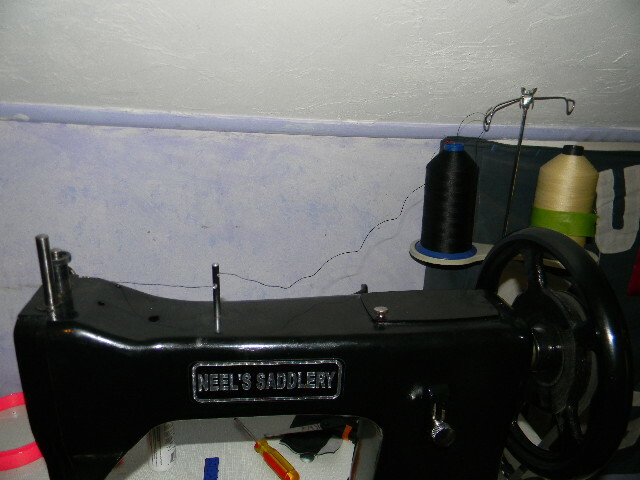 At 8:30 that night, Ryan, the owner of Neely’s, called me back and spent about 30minutes walking me through the whole process until I was successfully stitching again. Then we discussed ways to improve my machines performance when working with BioThane. 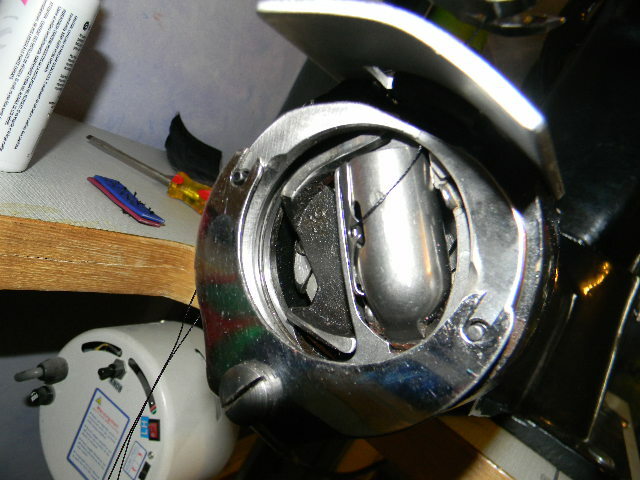 It turns out I was making two very minor errors in the set up in regards to the particular thread weight I was working with, but as most sewers know, even the tiniest error can throw the whole sha-bang off. I am very much looking forward to hopping back into the driver’s seat tonight and getting the batch back under way. I am also proud that I purchased this particular second hand machine, that originally came from a family owned independent American owned company, that prides itself in such outstanding customer service. I could not expect a one on one walk through over the phone late on a Sunday night if I had purchased a machine from a big corporation. I will certainly be a returning customer and will be purchasing some different needles, thread and a specific BioThane friendly oil and pot from Neely’s in the very near future. 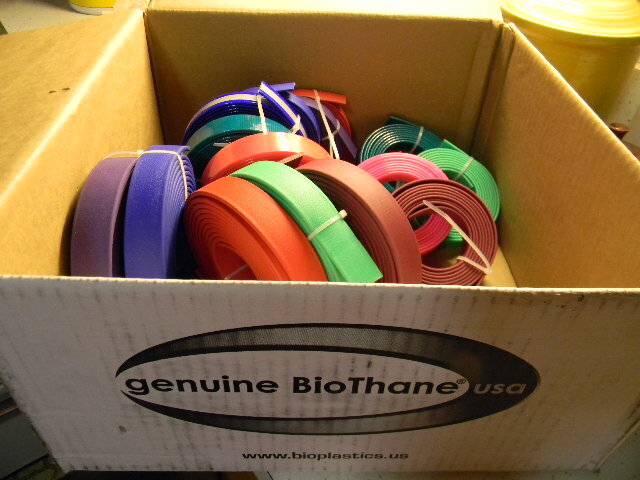 Bottom line, the BioThane project hit a learning curve, but we took it head on and are back up and running. 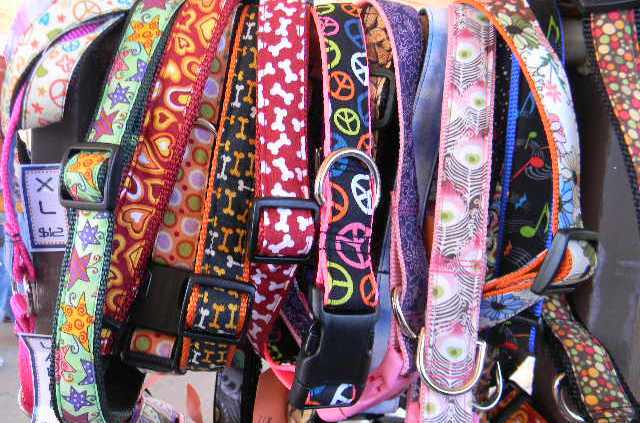 Can There Be Too Many Dog Collars? 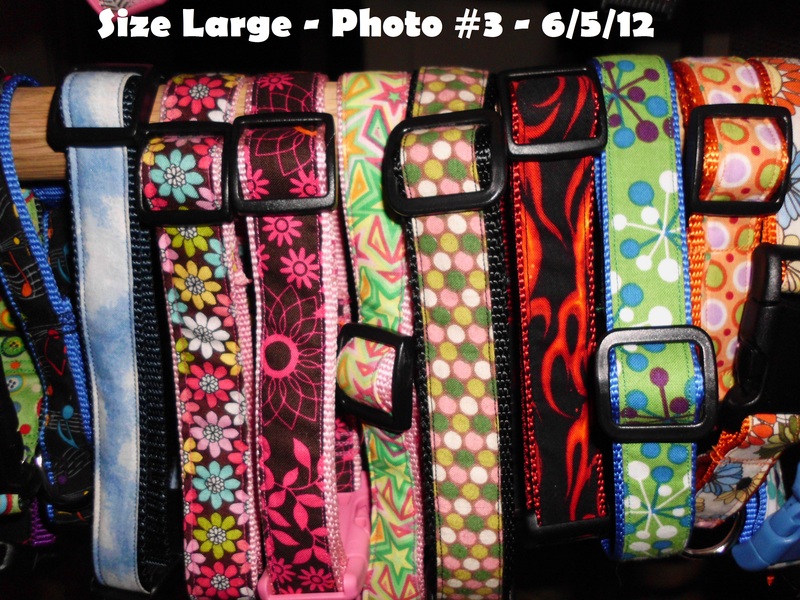 Last week I completed 65 dog collars to add to the selection we already had available. 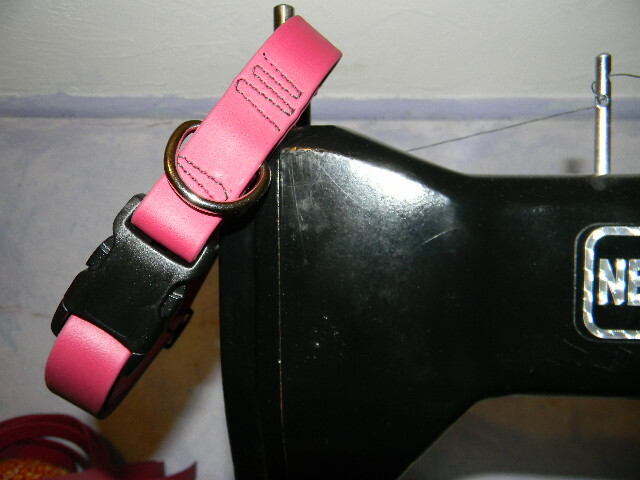 The previous selection was already over packed onto the rack we use to display them and after adding the new additions this Saturday, we decided that the dog collar rack is now severally ‘over grazed’. Rich started making a new, much larger rack to display them that afternoon. The new rack is going to be four feet long and will have four rungs. The current rack has three rungs on which we display sizes Medium, Large and XLarge. 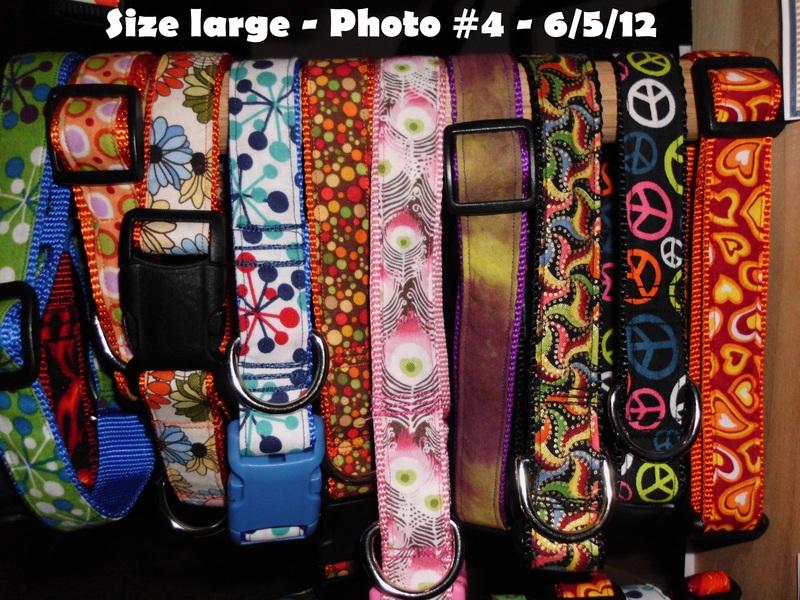 The new rack will still display those sizes, and the additional rung will be for the new selection of Small and XSmall dog collars that are in the works. 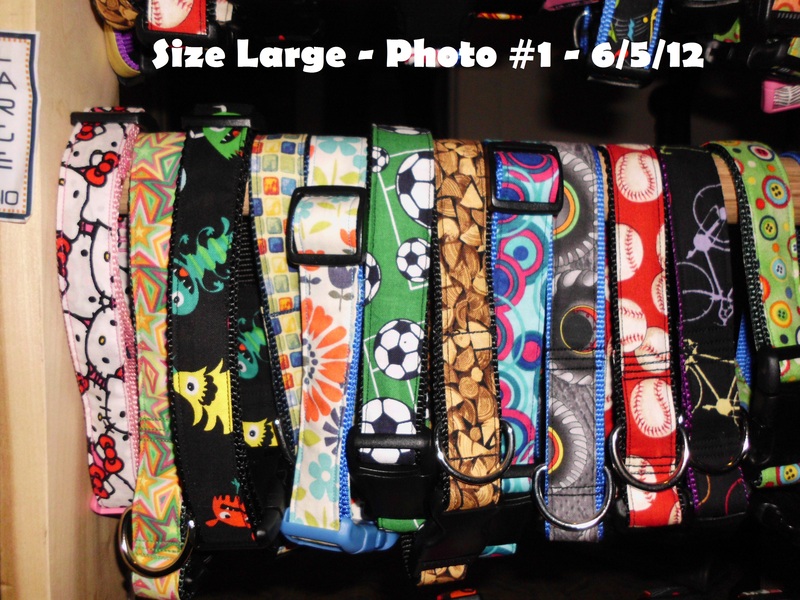 I took these photos at the market to show the extraordinary selection we currently have. 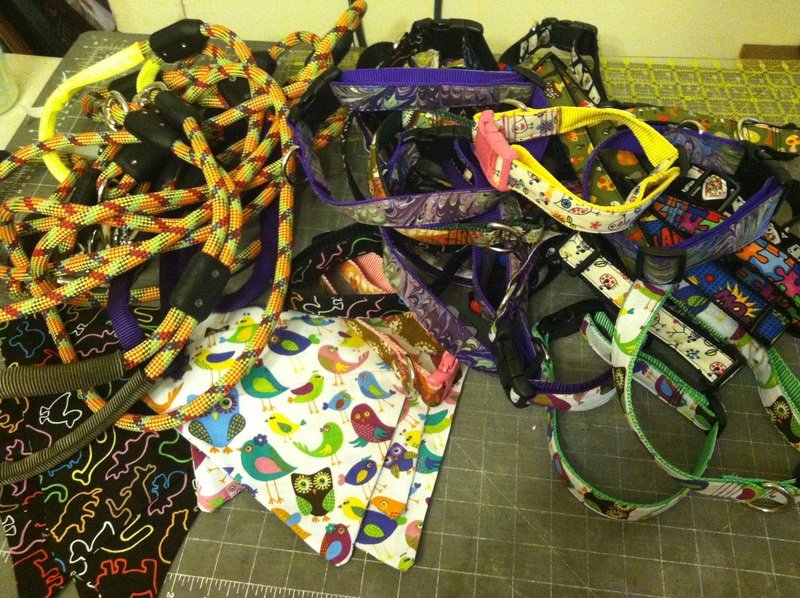 The pile of collars in the front was held back and not put out this weekend. It’s nice to have some extra inventory again! The Valley Fourth of July! How Will it Fit into the Truck?